Taking a Segway tour around Uluru is a great activity for the family! With a minimum age of only 12 years old, the kids (and the big kids) will absolutely love zipping around on these fun and easy to ride machines. 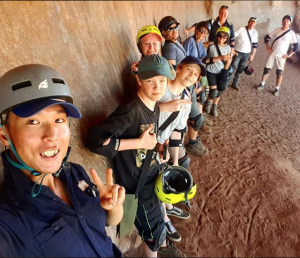 Even the adults will find themselves embracing their inner child as they zoom around the rock in style whilst enjoying the scenery and cultural significance of Uluru. Have you ever wondered what lives in the desert? Take the family along to Red Desert Reptile Show which is held daily at 10am and 2pm. The show provides an opportunity to get up close and meet live lizards and snakes that call Central Australia home. With entertaining and knowledgeable presenters the whole family will have a great experience and leave learning a thing or two about the critters that call Uluru home. Did you know that the outback of Australia has the largest population of wild camels in the world? If you have a love for animals you and your family shouldn’t go past a camel tour at Uluru. Uluru Camel tours run several camel tours throughout the day. We recommend taking the Camels to Sunset as the Sunrise can be quite early and as you probably know already, taming children at 5am in the morning can be quite the chore. Minimum age for a Camels to Sunset tour is 5 years old, however there is a petting zoo that you can visit during the day to keep the under 5’s happy. Walking the full 3 hours around Uluru and the Valley of the Winds at Kata Tjuta can be quite taxing, so we suggest to save the walking for Walpa Gorge. Walpa Gorge is a 40-minute walk between two of the major domes at Kata Tjuta. Making it the perfect compromise. Walpa George is a fun, 2.6km walk which provides a unique way to Kata Tjuta. The ground can be a little uneven so make sure you wear the appropriate footwear. In the weather isn’t too hot, pack a picnic and stay for sunset and you’ll be greeted with breath taking views as the colour changes on the rocks. For something unique why not consider a Sky dive? Sky Dive Uluru offers one of the best views of the Central Australian landscape that money can buy. With a minimum age of 12 years this is the perfect activity for the older families with big kids wanting an adrenaline fix! After a jam packed day of adventuring unwind at the Outback Pioneer. There’s live music and plenty of space to spread out and a few different options for restaurants. One of our favourites is a Self-Serve/Cook interactive cooking experience. Here you may try meats such as kangaroo, Emu or even crocodile! Don’t worry there is your standard Steak and sausages, for those fussy eaters. BBQ’s never sounded so fun. 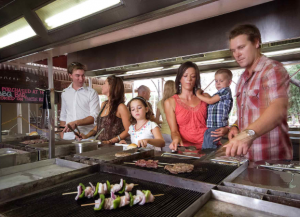 This option comes with a complimentary buffet you and your kids will have a blast whipping up some outback-culinary cuisine. As you can see there are plenty of things to do on your school holidays at Uluru. Whatever you chose your time is going to rock with with plenty of options your kids will love. We look forward to seeing you and your family up here in the Aussie Outback soon.